Provides a set of minimum standards and practices for the safe and healthy operation of a laboratory. What is occupational health for researchers? What additional information should I know about vaccine options, health status and other healthcare? What permits & registration are required? What are the lab training requirements? What are the lab procedure requirements? What are the lab inspections requirements? What are the other laboratory documentation requirements? What are the minimum requirements for PPE? What is job specific PPE? What is the best practice for use, care & disposal of PPE? The first step to safety in the workplace is to identify the hazards that are present. Then, you must do a risk assessment which takes into account the probability of the hazard resulting in an adverse effect (ex. almost certain, practically impossible), the exposure that the worker would be have to the hazard (ex. 5 minutes, 8 hours), and the consequence if the hazard did harm the worker (ex. Fatality, first aid treatment). If it is determined that there is a risk present, controls are implemented to minimize the risk to the worker. Can you remove the hazard completely? Can you use something else that less hazardous? Can you use something that has safety built into the design of it? Can you provide the worker with information that can help control the hazard to a level that is as low as reasonably achievable? Musculoskeletal Injuries affect muscles, tendons and ligaments, nerves, blood vessels or related soft tissue. These injuries have a multitude of origins such as overexertion from lifting a heavy box or from repeatedly using the same muscles over and over again. Human Resources has created a section on Lab Ergonomics which provides easy to follow descriptions on how to maintain an ergonomic posture while working in a lab setting as well as a guide on common equipment used in the lab and ergonomic alternatives. Occupational Health refers to the worker’s safety in the context of occupational hygiene, respiratory safety, ergonomics and human factors. For more information about occupational health for researchers, see the RMS Occupational Hygiene section. Occupational and Preventative Health (O&PH) is an in-house program that offers medical services such as vaccinations and health screenings to protect the health and well-being of UBC employees. The services are offered free of charge to the individual and are confidential. For some workers, enrollment in O&PH is required by provincial and/or federal regulations. To find out more, visit the Occupational and Preventative Health Website. Documentation is used by federal, provincial and UBC Health & Safety inspectors to gauge the level of commitment to working safely in your laboratory. Where documentation is available, it provides evidence of due diligence and regulatory compliance; where it is missing, it indicates safety program shortcomings. Many types of research require permits and/or instrument registration, certification, or validation. If you wish to use biological materials, you must apply for a Biosafety Permit. If you wish to use radioactive materials or devices containing radioactive sources, you must apply for a Radiation Permit. Documentation of training is required by federal and provincial regulations and by UBC policy. There are 2 levels of training: institutional and worksite specific. Worksite specific training is completed within the lab and must be recorded as part of the general laboratory orientation. An individualized training needs assessment and a record of each technique or task learned must be documented. Written procedures must be available to staff and students for all tasks or task types done as part of their work at UBC. Procedures may be commonly referred to as protocols, standard operating procedures (SOPs) or safe work procedures (SWP). Regardless of what term is used, the procedure must include safety measures required for the task outlined including PPE, engineering controls, and administrative controls. Laboratory Hazard Door Signage provides emergency responders with a comprehensive view of the hazard classes contained within a laboratory space to determine an appropriate and effective response to emergency situations. These signs are placed at the entrance of workspaces where hazards exist. To see what each sign symbolizes, see the Laboratory Hazard Signage Document (PDF). 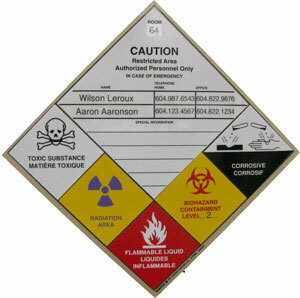 Whenever hazardous materials of a specific class are added to or removed from the laboratory’s inventory, this information must also be passed on to Risk Management Services to update the sign. To request, update, or replace an existing poster fill out the Laboratory Hazard Signage Application Form (WORD) and email to the RMS Research Safety Office. Questions about the signage program should be directed to the RMS Research Safety Office. Personal Protective Equipment is the last line of defense as it acts solely as a barrier between yourself and the hazard. Once that barrier is broken, you are exposed to the hazard. The hierarchy of controls must be considered before resorting to PPE. However, when there is a need for PPE, it must be worn regardless of the other control measures that are in place. Depending on the hazard, a wide variety of additional PPE must be worn. This will range from the type of glove, eye protection, coveralls, aprons, head covers, specialized shoes, or numerous other forms of PPE. A summary of items is below but more information can be found in the Biosafety Manual (PDF), Chemical Lab Safety Manual (PDF), and Radiation Safety Manual (PDF). The proper protection of your hands is critical. When handling hazardous materials, the appropriate gloves must be worn. Please consider whether the hazardous material will react with the material of the glove, the rate it will permeate the glove material, and the dexterity required. Nitrile/latex – protection from many chemicals and all biological materials. Often appropriate when working with radiation as well. Rubber gloves – many chemicals react with latex or nitrile, rubber gloves offer an alternative. Insulated gloves/mitts – protection from very hot or very cold objects. So objects being removed from the freezer or autoclave. Kevlar or leather – protection from sharps objects, rough surfaces, or bites. Long hair needs to be tied back in all wet laboratories. There are three main categories of eye protection. At no time are everyday prescription eye glasses considered to be eye protection. Safety glasses – Projectiles (flying objects) – protection from flying particles from the front or side. Splash goggles that form a seal around the eyes – protection from liquids splashing into the eye. Face shield – used to protect not only the eyes but entire face from splashes and projectiles. It is important to consider the type of sound that may be affecting your hearing. As a general rule of thumb, if you have to raise your voice to be hear when you are arm’s length away from the person you are talking to, the noise is at a hazardous level. Ear plugs – may be used for low or high frequency noise. Be sure to check the product to determine the frequency levels that the earplugs are approved for. Arm covers – protection of forearms by using sleeves usually made of chemically resistant material. The exposure risk is usually from chemical or biological materials. Respirators are designed to keep airborne contaminants out of the worker’s respiratory system and provide a safe air supply. For more information on respirators, click here. All PPE require the proper care, use and disposal. Each piece of PPE has different requirements, and it is critical to review the manufacturer’s instructions, as RMS cannot list everything. The following is a very short summary of the most common PPE used in laboratories at UBC. Disposable gloves – latex and nitrile gloves are meant to be DISPOSABLE, this mean changing them often and not re-using. Ensure that the gloves are disposed of in the appropriate waste stream. Re-usable gloves – insulated, leather, thick rubber gloves are just some example or re-usable gloves. Please be sure to neutralize, clean or disinfect the gloves regularly. When they can no longer be cleaned then they must be disposed of in the appropriate waste stream. Chem Stores at UBC (all lab coats MUST be decontaminated or neutralized prior to cleaning). N95 masks – one time use, need replacing for every wear. Half/full mask – clean the surface with appropriate wipe, store the mask in a sealed plastic bag with your name, ensure the cartridges are replaced frequently. PAPR – clean the surface with appropriate wipe, place battery pack in the charger, store the hood and belt in a safe place.